(Photo: Ecumenical News / Young Kun Park)The Rev. Olav Fykse Tveit, general secretary of the World Council of Churches speaks during a press conference during the 10th Assembly of the WCC in Busan, South Korea on October 31, 2013. BUSAN, South Korea - The World Council of Churches says it stands ready to facilitate a meeting of key religious leaders – including Muslims - to help politicians bring about a lasting peace and reconciliation process in war-torn Syria. "We still have to see if it (Geneva 2) happens. We will try to gather both church leaders - and also Muslim participants - for a wider consultation about what religious leaders and communities can contribute both to promote and push for a Geneva 2 meeting to support those leaders who have to take tough decisions to start the political process to solve the conflict," said Rev. 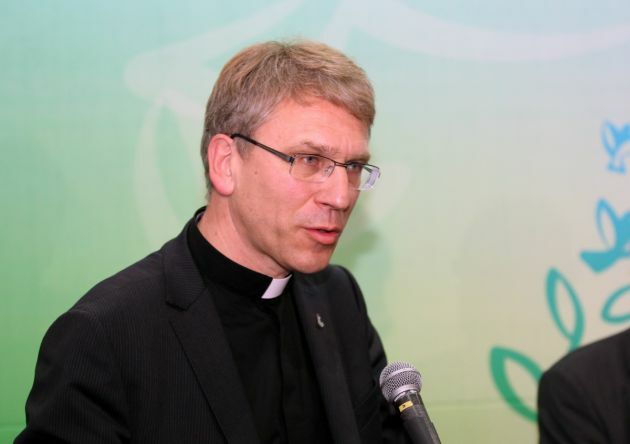 Olav Fyske Tveit, secretary-general of the WCC. The head of the world church body representing some 560 million Christians from all over the globe was speaking at his first press conference at the 10th WCC Assembly in Busan, South Korea on Thursday. Tveit, a Norwegian Lutheran, said the WCC is ready with its plan to convene such a meeting. "We have already made plans for it but I cannot announce the plans before we know that it will happen," he told journalists covering the WCC convention in South Korea's second largest city. In September, the WCC made plans to mobilize churches and Muslim organizations from Syria, Russia, the US and European countries to help bring about a peace settlement in Syria. Following talks in Geneva with former United Nations Secretary General, Kofi Annan, and Lakhdar Brahimi, the UN-Arab League joint representative for Syria, Tveit had said: "There is no military solution to Syria. Now is the time to say everyone has failed. And there has to be a change and that change has to include all parties and that includes the president (of Syria). After the September meeting, the WCC said in a statement, "Churches must continue to raise their voices in their congregations, in their societies and with their governments. We must strengthen the public outcry so that those in power will protect the common interest of humanity." The Geneva 2 Middle East peace conference is a proposed UN- backed peace conference that was originally expected to be held towards the end of 2013. Its aim would be to end the Syrian war and to persuade the warring parties to find a solution to the conflict and then build on a peace plan put forward by Annan in June 2012.